There’s something great about playing with miniatures you’ve painted yourself. Even if you’re more a “theater of the mind” type GM, having a few miniatures on hand is useful. But are you painting enough of them? Storytime folks (or a thinly veiled reminiscing, really). I got into Warhammer 40K about twenty years ago. That led me to Warhammer Fantasy Role-Playing, which was when I first bought a box of beastmen and a paint set. I painted up one of the beastmen and the chaos warrior that came with the paints, but most of my roleplaying was with grey plastic. The first miniature I ever painted is a testament to suckage. Over the next twenty years I bought odd miniatures to supplement my game: some hobbits, an elf, the nine companions from The Lord of the Rings, and some figures I found at second-hand stores. If I did paint any of them, they remained unfinished. Most are still grey metal or plastic. My chaos warrior, the second mini I ever painted. This week I gave him a black wash and varnish. It really improved the old paint job. Then came pre-painted, blind-box miniatures. I bought loads of the Dungeons & Dragons miniatures, and have nearly completed the War Drums set, with 9 rares left to go. Now I didn’t need to paint, I could just throw miniatures on the table. Then a friend and I got into the Dungeons & Dragons Adventure Boardgames, and started painting up minis from the boxes. When I moved back home from living in Japan I discovered that my paint set, now two decades old, was still good, and kept going. Suddenly, the bug had bitten, and I was hooked. Painted, even badly painted, is better than grey plastic. Simple paint jobs are perfect for gaming. Start it and finish it, then move on. Try new things, but not all things at once. I reckon that most of us have mountains of unpainted minis because we get discouraged at some point. We know our minis won’t be Pinterest worthy, or that it’ll take too long to finish a figure, or we’re just not excited about what we’re painting anymore. For me, having to fork out money for two pots of grey paint kept me from finishing my gargoyles. When I figured I could mix acrylic paints I had around the house there were no excuses left — and I was done in half an hour. It was a really silly thing, but I saw a roadblock and let it derail me. This guy just needed an undercoat, two shades of grey, and a good flocking to get him ready for the gaming table. Point 5 touches on something that can also discourage you, especially if you’re new to painting. It’s tempting to want to try every new technique you’ve learned, or to play it safe and only use techniques you’ve mastered. Trying a new thing every now and then lets you learn and explore, while keeping the process exciting. The flock on the gargoyle above was an experiment that I very nearly scrapped, but it worked in the end. Other things motivated me to get painting RPG miniatures again too. I recently deep-dived into Warhammer Age of Sigmar, which I’ll talk about in another post, and I started watching some excellent YouTube channels. Luke’s Affordable Paint Service (YouTube Channel) is excellent for terrain and scenery, and, like me, Luke loves finding a bargain. Luke also has a great contest on right now for his range of speed-basing materials. Miniac (YouTube Channel) is an awesome painter, and like Luke has a great sense of humor. His level of detail is way above what I’m going for, but Scott does an awesome job of explaining the basics well. PAINT MORE MINIS! Tabletop Minions (YouTube Channel) feels like chatting about the hobby with someone who knows the ins and outs of the hobby intimately. Atom Smasher, the channel’s presenter, has loads of great tips, presented as opinion pieces that are a joy to watch. YouTube has plenty to offer for painting and miniature conversion besides these three, but they’re channels I keep coming back to. Another thing that’s making my painting easier is that I work in sets of three. Three zombies, three wraiths, three whatevers. This lets my paint go further once it’s on the palette, and gives me a chance to try different things with each figure. For bigger miniatures, I’ll work on one at a time, but for short painting sessions, three figures usually get done in 30 minutes of painting, and I can let the others dry while I work on one. Three is also a good average when painting RPG miniatures for most encounters. Two of three wights, done together. Skeletor, with the yellow face (right), came from me messing around. I’m very happy with these. In the words of Miniac, “Paint More Minis!” Keep it fun and free and you’ll work through that heap of plastic and metal in no time. Some ghouls I painted for Part 3 of Doomsday Dawn. I painted six undead in my spare time, over a few weeks. The Pathfinder Playtest is here, and this past weekend my players and I took our first dip into the new game. The first session of the Pathfinder Playtest was brutal. It might be more a factor of encounter design than the new rules, but two of my three PCs fell dying at some point, as did the third PC’s animal companion. Fortunately, all the characters survived, thanks to our overworked cleric. The party left the dungeon twice during the session to get a full rest, and by the end of the session they had five rooms left to explore. While the players liked the three actions a round mechanic, we often didn’t use the third action for a third attack, it was just too risky. There were plenty of critical failures without taking a –10 on the roll. As a GM, I felt that I had more options with my NPCs, though this might be because I haven’t played Pathfinder for a while and have learned so much since I last ran a game. PF2 monsters are certainly easier to run, with stat blocks that aren’t more complicated than they need to be. It did take lots of work to digest the Core Rulebook, but once I’d gotten something down, it proved easier to recall than in PF1. My wife, a PF1 regular, said that she found character generation much easier in PF2. Character gen took about 3 hours for us, on average. I’m looking forward to playing more of the Playtest and I’m excited about Pathfinder’s future. We’re running a 30% Off sale on all our Pathfinder Roleplaying Game compatible products, including maps. 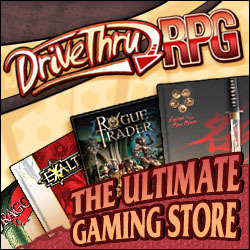 Check out the sale on Drive Thru RPG. Endz has named The Culinary Magic Cookbook as a potential top 10 book for 2018. Congrats to all our friends at Flaming Crab Games! Till next time, may the dice of fate land in your flavor favor.